You know how movies and books always show crazy, spontaneous acts of love that come at the perfect time and are far beyond the expectations of the person receiving them? But before you go lowering your expectations for the romance in your relationship, there are ways to keep the butterflies alive! It's just going to take a little more work and planning than they shown in romantic comedies. Designated Date Night: Pick a night, it doesn't have to be Friday, and give it the name "Date Night." No cell phones, no iPads, no distractions. If you have kids, book a babysitter for that night from now until forever. You and your significant other NEED this. Think of it as an investment in your future happiness. Make A List of Practical and Dream Dates: If you wait until an hour before your date and say, "What do you want to do?" it's an instant mood killer. Sit down together and come up with a list of practical dates that you both enjoy. For example, the zoo, the aquarium, a museum, browsing the book store, taking a cooking class, etc. Then make a list of Dream Dates that you will have once every couple of months. These are the more extravagant dates that you couldn't do on a weekly basis. Now schedule a week in advance. Planning Leads To Surprises: When you're working to keep the romance alive, you and your partner are more likely to be in the mood to surprise each other. You may want to take one date night in the month and make it a secret date that you know the other will just die over. You may start see impromptu romantic acts, no matter how small, from your spouse. The bottom line is you have to make a conscious decision to improve the romance in your relationship. Nothing magical is going to happen without a little bit of hard work. We came up with 5 ways you can avoid the arguments, contention, and sometimes divorces that can happen from not having open communication about your finances! 1 - Write Down Your Financial Goals Together: This will hold you accountable. If you and your significant other sit down and discuss what you want your future together to look like, it will give you something to work toward as a team. 2 - Go To A Financial Advisor Together: This can also include going to financial seminars, reading books, listening to audio programs, etc. There are so many ways to learn about finances, why not set yourself up for success? Learn how to budget and handle your money in a smart way! And the most important part is to do it together. 3 - Don't Let Money Be A Stress... Talk About It: If you are consistently discussing where you stand financially with your partner, stress about money will be eliminated. When you're on the same page and know exactly where your money is going, you don't have to worry about how the next bill will be paid. 4 - Save Receipts: Yes, this seems old school, but the act of having to ask for your receipt when you make a purchase and then file it away makes you more aware of what you're spending. It's the same concept as some people preferring cash to cards because they can actually see how much they have and what they are putting out. Having a stack of receipts in front of you is much more powerful than looking at your purchases on a computer screen. 5 - Have One Day A Month For Financial Planning: Put it on your calendar and follow through! Sit down with your partner, pull out the receipts, pull out your budget, and see how much closer you are to your goals. This doesn't have to be a stressful meeting either. If you have been following up throughout the month, there will be no surprises. Keep yourselves accountable! Introducing... The Janeen and Tia Show Podcast! Check out our very first podcast! 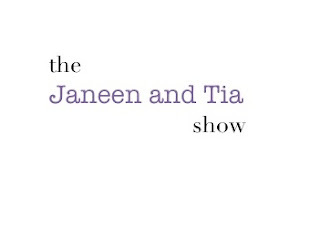 The Janeen and Tia Show is all about relationships, marriage, divorce, dating, self-improvement, etc. It's a lot of good info and a lot of fun! You can listen to the podcast at http://janeenandtia.podbean.com/ or go to iTunes, search The Janeen and Tia Show, and download! Expect a new podcast every Thursday! 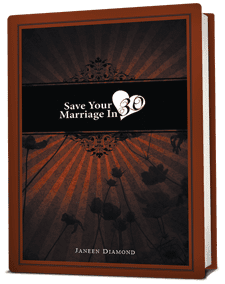 First of all, make sure to watch Janeen's video for Tip #5 in her series, What A Woman Needs From Her Husband! You can watch it here along with the previous 4 tips. Be sure to subscribe to our You Tube Channel while you're there! -Everything relationships, divorce, dating, marriage, positivity, etc. -Discussions about current events that relate to any of our topics. -Guests from counselors, to motivational speakers, to organizational experts! You will know the second we get everything launched and we can't wait for you to tune in! Is to eat AT LEAST one meal a day (preferably dinner) at your table... without any TV or electronics. GASP! We know, you likely only enjoy eating if you're being entertained, but think of your significant other as your entertainment for the night. 1 - Instead of just the highlights, you'll get to know about the little things that happened in their day. This can lend a lot of insight into how they're truly feeling about life. And this is all about getting to know each other and being a team. 2 - You are practicing the big C word... Communication. You may sit in silence for a lot of it only serenaded by the sound of chewing, but the more you do it, the better you'll get. Pretty soon you'll have plenty to talk about and actually look forward to that time when you can enjoy dinner, your partner, and some conversation. 3 - This just might help you eat healthier! Without the distraction of television you have to pay attention to what you're eating. You're not mindlessly shoveling food in your mouth. You'll be more aware of when you're full. So really, eating dinner at the table with your significant other just might make you more healthy! We have begun a new video series called: What A Woman Needs From Her Husband! A new tip will be posted each Tuesday with 7 videos total. 3 tips have been released so far! Subscribe to our YouTube Channel HERE and watch the first 3 tips! This series will be followed by: What A Man Needs From His Wife. Enjoy and keep improving! 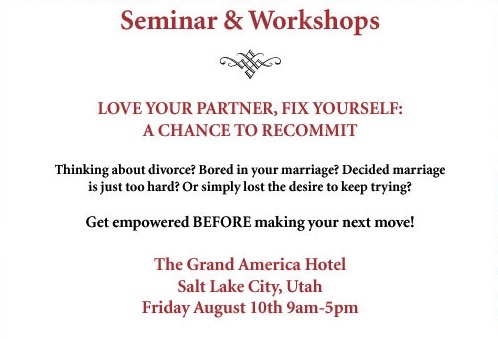 Register now for our August 10, 2012 Seminar! 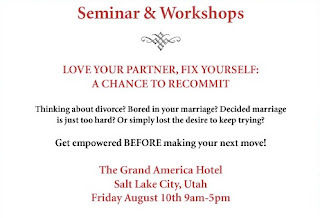 We are very excited to offer our very first seminar "Love Your Partner, Fix Yourself: A Chance To Recommit"! The event will be August 10, 2012. Come on your own or with your spouse. There is special pricing for couples! Click HERE to register!